POP QUIZ: What’s the strongest story line of Indian Wells so far? Is it the emergence of American Amanda Anisimova, the 16-year-old who beat two seeds before going down to No. 5 Karolina Pliskova? Is it the absence or ineffectiveness of most of the men’s Big 5? Murray, Wawrinka and Nadal are all out with injuries, and Djokovic was less than impressive in his opening-round loss. Is it the ongoing and stand-alone excellence of 36-year-old Roger Federer? Or is it the return of Serena Williams, just six months after a very problematic caesarean surgery? She beat two seeds, knocking out one top 10 player and Slam champ, Petra Kvitova. Then she gave the world No. 5, Karolina Pliskova, a formidable scare. And she’s only 16. After fifth seed Karolina Pliskova stopped Anisimova’s Indian Wells dream run, Inside Tennis caught up with the new force everyone is talking about to ask some questions. IT: You’ve gone from one great success to another. Do you think you’re living the dream? AMANDA ANISIMOVA: For sure, playing two top 10 players in a row is exciting. It’s been a great week for me. IT: If you had one word to describe your experience at this tournament, what would it be? AA: I would say blessed. AA: That I could have this opportunity to play all these players, and I got the [Oracle Challenger Series] wild card also, so that was an amazing opportunity. Without that wild card, none of this would have happened. IT: One of the big questions going around the grounds is ‘How far can Amanda go?’ If you had to answer that question, what would you say? AA: Well, I believe I could be No. 1. IT: If you could hold up one of the Slam trophies, would it be the Open, Wimbledon, in Paris, or …? AA: The Open, because it was the first and last junior tournament that I won of the Slams. IT: At the US Open, I imagine you played many of your matches on the outside courts and the wonderful grandstand court. Did you ever look up at Ashe [Stadium] and in the back of your mind say, ‘Some day I can get there’? AA: Yeah. A couple of days after I lost my [women’s] qualies match, I went on Ashe when no one was practicing and thought, ‘Oh my gosh, I want to play here so badly.’ That made me really motivated. Then I won the juniors and now I’m just really excited. IT: What’s the one thing that you really love about tennis? AA: It’s an individual sport, so it’s all on you. At the end of the day I know what I need to work on. IT: You’re so poised for a person of your age. Where do you think that comes from? AA: I don’t know. A lot of people tell me that, but I don’t really think that of myself. JUST WONDERING: We know Amanda Anisimova is a super talent. But is she the most clear-headed and centered 16-year-old to enter the game in years? GO FIGURE: Roger Federer could reach the BNP Paribas Open semifinals without playing someone ranked higher than No. 25…When he was introduced at Roger’s fundraiser in San Jose, Jack Sock was said to be from Kansas City, Kansas. In Indian Wells he was said to be from Lincoln, Nebraska. DO YOU WANT TO MAKE A MILLION? 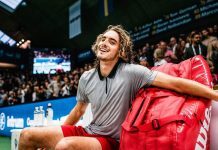 Pierre-Hugues Herbert and Sam Querrey are all still eligible for a million-dollar payoff if they win both the singles and doubles at the BNP Paribas Open. IT’S NOT GREEK TO HIM: 30-year-old 12-year veteran Marcos Baghdatis knows all the ins and outs of life on the circuit. Badly injured last year, he suffered a wretched season. But here in Indian Wells, only his third tournament this year, he went through qualifying and has won five matches in a row, including a victory over 14th seed Diego Schwartzman. In the fourth round he’ll face Milos Raonic. A BOUCHARD DAY’S NIGHT: Genie Bouchard got a lot of exposure because she exposed a lot in Sports Illustrated’s swimsuit issue, and she won a presumably large settlement from the USTA in her long, contentious suit over her fall in a US Open conditioning room. But in other ways she’s been falling. According to Stephanie Myles, her agent John Tobias has left her, her ranking is now a lowly No. 116, so she can’t get directly into big tournaments, and she’s getting no compensation from her Nike endorsement deal. She’s also lost her racket deal with Babolat, and observers are wondering whether she’s going to have the same career path as Alexandra Stevenson, who, like Bouchard, had a fabulous Wimbledon run but did very little after that.